Apartment sales volume, maturing loan refinances and the conversion of construction loans to permanent financing has propelled multifamily lending so far in 2015. Commercial mortgage-backed security (CMBS) originations have increased, with conduits issuing $5.4 billion of multifamily loans during the first five months of this year. CMBS should issue a total of $9 billion to $11 billion of multifamily loans by year’s end, according to Trepp, an analytics provider focused on conduits. This total would represent at least 20 percent of all multifamily lending volume for the year. The agencies — Fannie and Freddie Mac — along with banks will account for the remainder of issuances. Last year, banks accounted for nearly 37 percent of all rental lending volume. Most conduit deals comprised smaller loans this year; however, Trepp notes that a few large portfolio deals have also been closed. The majority of the recently securitized CMBS deals are collateralized by partial interest-only loans. These notes have a specified number of interest-only periods, after which the loan begins to amortize, ending with a balloon payment of the remaining principal in the last period. 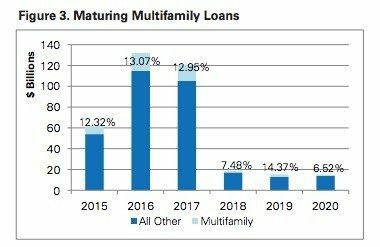 A large number of maturing multifamily CMBS loans will be up for refinancing during the next 2 1/2 years. 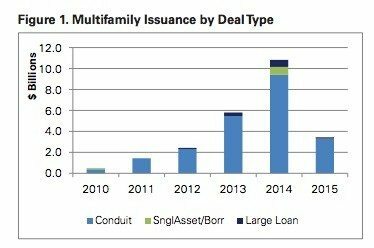 Between 2015 and 2017, $40.5 billion in legacy multifamily CMBS is set to mature — $7.6 billion of which comes due in the final seven months of 2015. According to Trepp, maturities will peak at $17 billion in 2016 and will fall to $15.6 billion in 2017. Of the loans maturing in the next four years, occupancy exceeds 95 percent in more than half of the underlying properties. Roughly 15 percent of properties feature occupancy below 85 percent. Several factors could impact CMBS lending volume moving forward. In May, the Federal Housing Finance Agency ruled that the agencies could finance an additional $15 billion. New issuances by CMBS could slow as Fannie and Freddie become more active in the market. In June, the Federal Reserve elected not to raise rates; however, rates are expected to rise slowly before year’s end. An increase in rates will make refinancing more challenging, as borrowers will find it harder to achieve required debt service coverage ratios.